Zurich Chess Challenge live with computer analysis. Earlier start for the rapid tournament tomorrow, 4th February, 13:00 CET. Final round of Zurich Chess Challenge 2014 finished with a draw between the current World Champion Magnus Carlsen and the previous one Viswanathan Anand after 40 moves; draw between Nakamura and Gelfand in 21 moves (followed by a rapid game); and the win of Caruana over Aronian. Pelletier asks Aronian: Have you ever lost a game in the Marshall? 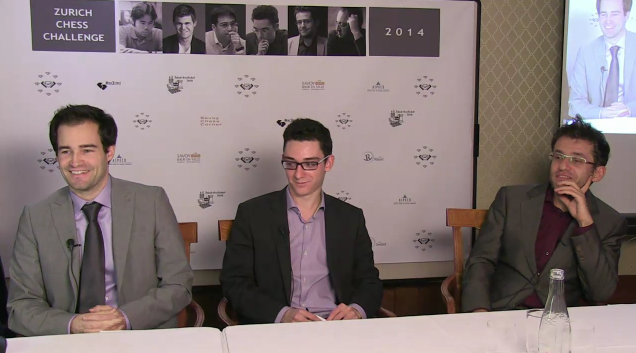 Levon Aronian: I don't remember losing but this was bound to happen. Tomorrow, 3rd February, there will be a 5-round rapid tournament from 13:00 CET. Rapid tournament - tomorrow, 4th February, 13:00 CET. Watch Zurich Chess Festival live at ChessBomb with computer analysis.